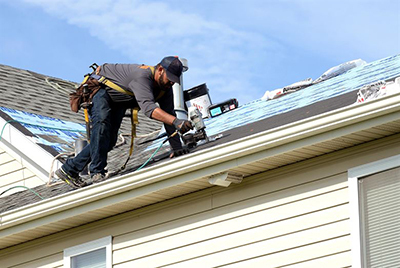 One of the more important home improvements you will undertake is installing a new roof. For the new home builder, you have a choice as to what type of product with which you will roof your property. Before taking the plunge, make sure you consider all your options. This really should be a ‘one of’ project for the average homeowner. If installed to the manufacturer’s specifications, your new roof should last at least 30 – 40 years in the Australian climate. You have many choices of styles and designs from which to choose when selecting your roof. Nearly all roofs in Australia are tiles or tin. What All American Roofing is offering is a product that covers over 70% of all the home roofs in the USA – asphalt roof shingles. As a roofing material, asphalt shingles provides an excellent bang for your buck. The warranty that is offered for this product is up to 50 years, that’s how confident All American Roofing is with the GAF asphalt shingle. As a company, GAF roofing products have been in the game for 130 years. Their name is synonymous with quality and reliability. We offer different styles and coloured shingles to suit all manner of roofs. To appreciate the difference in shingle styles, it’s a good idea to pop into the showroom or call our representative for an obligation-free quote. The rep will bring shingle samples to help you choose the best option for your home. Below, we have descriptions of the products All American Roofing is offering along with some of their specifications. These are an extra-large shingle and combine a 3-tab design. They have a special row of Dura Grip adhesive seals that help them stand up to very strong winds. The Royal Sovereign is among the most preferred shingle in its class with good reason. They have an extra strong Micro-Weave core for durability. These asphalt roof shingles come with the normal 25-year warranty and the A class fire rating. These are extra-large asphalt roof shingles that are rated to withstand strong winds and they have the appearance of slate. They have Class A fire rating and with their heavier design, they are an affordable alternative to authentic slate roof shingles. There are double rows of Dura Grip adhesive seals on each asphalt roof shingle as well as algae protection. They come with our standard 50-year warranty. There are a number of variations available in the Timberline HD series of shingles. They’re 33% thicker and up to 50% larger and the Timberline style features highly contrasting colour blends, giving them a dimensional look when installed. This weight adds to their durability and the Micro-Weave core gives great protection. A Class A fire rating along with algae protection and 30-year warranty make this a very popular shingle. This style of Timberline shingle will look stunning on your home. There is a wide range of colours available such as charcoal, hickory and stone gray, for example. They are designed with Advanced Protection Shingle technology which saves over-using mechanical cooling in your home. The Dura Grip adhesive seals help to keep the tiles in place in very high winds. The class A fire rating applies as does the 30-year warranty. Don’t Risk It With An Inferior Product! GAF Roof Shingles Are North America’s #1 Selling Brand For A Reason. They’re The Best!